5.2. What Can Make a Big Impact on this PC? 5.4. How Can Skating Skills Affect Other Program Components? Putting together a learning burst at a competition requires advance planning and organization as there are many moving parts to consider. While some of the organization can be completed well before the competition takes place, most of the logistics can only be planned once the X&O’s become available. The starting point is contacting the technical representative to get permission to run this continuous development initiative for judges. Select topic “du jour” (i.e. SS, TR, P, COM, INT, GOEs, Levels). Prepare a learning burst invitation letter with name and date of competition, and topic of focus. Identify event(s) from competition schedule to use for learning bursts. Once the X&O’s are available, identify prospective moderators for targeted learning burst events. Ideally, moderators should be Challenge or Canadian level officials. Check how many judges would be available to attend the targeted events based on the X&O’s. Email prospective moderators inviting them to lead the learning burst discussion. Once moderator(s) confirm, edit the registration information accordingly indicating the event segment, date, time, moderator, etc. Email learning burst invitation letter to judges. Be sure to include the link for registration, registration deadline, and other pertinent information such as meeting time and place for learning bursts. Email resource materials to moderators for learning burst discussions as well as confirmed list of attendees. The (insert name of committee) is pleased to offer you the opportunity to engage in an exciting, continuous development initiative being held at (insert name of competition) this season. The intent of these sessions is to provide officials with an avenue to expand their knowledge and share ideas while learning from one another’s expertise. “Learning bursts” are a valuable tool to gain insight and new ways of looking at elements and program components from our peers. These discussions will take place in the stands during pre-determined events. There will be a facilitator for each session and this year’s discussions will focus on (insert topic). While honoring the Skate Canada Code of Ethics and in order to maintain the integrity of the events, it is imperative that the discussions held at these “learning bursts” are kept strictly confidential. As experienced officials your positive and ethical deportment is the key to maintaining the utmost discretion and confidentiality of these discussions. We are confident that each of you will respect this expectation to ensure the success of this activity and will at all times conduct yourselves in a manner befitting the privilege of appointment as a Skate Canada Official. The opportunity to engage in confidential and meaningful dialogue has proven to be an extremely valuable addition to any level of officials’ development. While participating in this collaborative and supportive environment, we hope that you will find the discussions with your peers stimulating and another opportunity to refine your officiating skills. Learning burst activities provide officials with an avenue to expand their knowledge and share ideas while learning from one another’s expertise. I hope you will kindly consider lending your expertise to a discussion by accepting to act as a moderator for one of the learning burst sessions at (insert name of competition). To assist moderators in preparing for learning bursts and identifying a topic for discussion there are some discussion resources, talking points and activities that can be provided for your use or moderators are more than welcome to structure their discussion as they like. Judges will be encouraged to sign up in advance for the learning burst and we will communicate the number of participants attending prior to the competition. A prompt reply is very much appreciated in light of the tight timeline ahead to organize the electronic registration. Your knowledge and experience is very much appreciated! Balance, rhythmic knee action and precision of foot placement: Focus on body lean and depth of edge – record how the skaters are moving their body in order to move quickly and powerfully across the ice (or not). Is there merely a vertical body line, or is there only forward-leaning body breaks, or do they incorporate a full range of movement off the vertical axis – and how do the power, speed, and flow differ between skaters with these qualities? Cleanness and sureness, edge control and flow: Identify the depth of skating vocabulary for each skater… how many rockers, counters, changes of edge do you see versus mohawks and three turns? How does this compare with speed and flow of the skaters? Power, speed and acceleration: Identify areas where the skater is varying their power and speed as dictated by the music. How do they generate power – from turns, mohawks, power threes, or stroking? Get the participants to identify areas in the program where they see changes in skating quality, or skating difficulty, or changes in speed and power. Ask them to identify what they think is generating these changes. One foot skating: Identify the depth of skating vocabulary for each skater… how many one foot turns are performed like rockers, counters, etc. Equal mastery of technique by both partners shown in unison (Pairs and Dance): For pairs and dance teams, study the differences between the two skaters with a keen eye. What do you see and how do you reflect this in your mark? In ice dance: Is there a variety of dance holds? Use of asymmetry and symmetry in positions? Where are the interesting highlights? Which transitions did you consider difficult and why? In pairs & ice dance, were they difficult for both? Did they use any series of transitional tools? Which elements had transitions in and out of them? Which transitions were performed with quality? What makes them quality transitions? In Dance: Are the transitions in unison? Do you think that any of the four criteria is more important than the other? Why or why not? Short Dance: Is there a creative link into and out of the Pattern Dance section and between the rest of the Short Dance? Commitment to performance and making it work. Did the falls and errors break this commitment and how will you reflect this? Was there a physical, emotional and intellectual understanding of their music and its character in the performance? At what point(s) in the program did the skater convey this? How did the skater convey this? Was the skater able to establish a connection with the audience? Did you connect with the energy they radiate? Was it consistent throughout the program? When was the skater most comfortable projecting? Did the skater(s) demonstrate strong carriage throughout the program? How did it affect their ease and clarity of movement of movement? How did their clarity or lack of it affect style, projection? Did the skater(s) demonstrate/achieve a certain style or flair (individuality)? How so? Expressiveness indicates individuality. Could this be clearly seen? What examples were there in the program of variety and contrast? Did the couple demonstrate this? In Dance, did they move as one? Were they equal in projection, style, carriage? Do moves and elements correspond to development of a story, theme or interpretation of musical composition? Do the skater(s) use movement as a language to express a concept? Do elements have a purpose and meaning? Make a drawing of the programs. Are there clockwise and counter clockwise movements? And linear and circular? Is there a logical and pleasing pattern on the ice? Is the full ice surface used? Half the group: pay attention to the design/dimension. Is the body used as a tool to create dimension? Upright or full range of motion? The other half of the group: pay attention to the music and movement phrasing, then switch. Do elements match the musical phrasing? Are the elements placed where the music calls for them? Was the skater successful at reflecting the style, character and phrasing of the music? Did they rely on repetitive movements? If so was it effective or uninteresting? Did the skater or team express musical details? How “detailed” were they able to be? Were such movements sporadic or consistent throughout the program? Did they understand the concept of a nuance? In dance especially, were they in time with the music? In Short Dance, did they express the character of the rhythms appropriately? In dance were they able to relate as one to express the music’s style and character? Skating skills form the basis for our sport, but like anything obvious, it is always good to review to ensure that we are not too simplistic in our evaluations and that we do not put ourselves into a position where we take this PC for granted. What Can Make a Big Impact on this PC? Lack of power, or variety in power. No variation of speed or intensity in power. Skaters can have different skills on different days. Everyone has a bad day… cannot get their feet under them. They are tired, stressed, nervous. The body tenses, the edge quality decreases, the easy flow turns into scratchy strokes. The message here is that even good skaters, with a successful record, sometimes have off days. We must evaluate what we see based on what is presented before us. Skating is more than skating fast – it is about generation of power from edges, changes of edges, and deep, smooth, powerful stroking quality. Power control is enhanced with body lean off the vertical axis, and depth of knee bend. These are not limited to older, more senior skaters. Skaters who manage to turn big tricks and difficult jumps do not necessarily have top notch skating skills. Traditionally, skaters performing elements that are ‘best in class’ at their respective level are typically awarded high Skating Skills marks – and sometimes without merit. We must fight against this bias and reward the skills for what they are. Vice versa, skaters that show excellent skills may not necessarily be able to perform the large scoring elements. What is the single most important aspect of Skating Skills that we reward?? 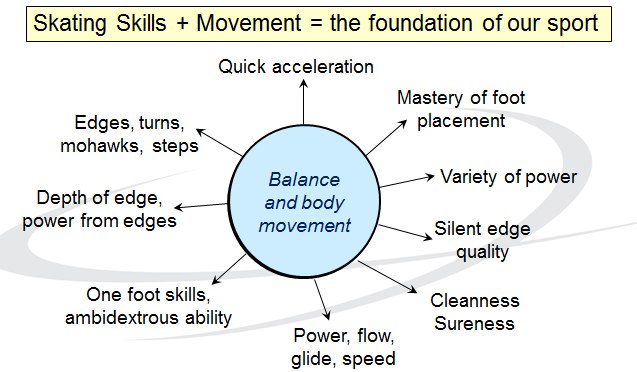 We are typically quick to assess the Skating Skills mark… but what is it exactly that we are basing our marks on? These are interesting questions to ask ourselves, and ask our colleagues. Is it power? Flow? Speed? Depth of skating vocabulary? Generation of power from said vocabulary? How Can Skating Skills Affect Other Program Components? Is it possible to have weak skating skills and excellent performance, transitions, and interpretation? Not usually – but the reverse is common. Even skaters with excellent quality can have poor components. Transitions – range of movement, sure and accurate foot placement, ability to generate power from edges and turns will help to increase the variety and quality of transitions. The Difficulty of transitions can also increase. Performance/Execution – strong body control, use of body line outside of vertical axis, deep knee bends, and fluid and sure movement play into this well. Performance quality is enhanced as there is a greater amount of physical commitment and use of space possible with those skaters having greater skill. Composition and Interpretation – variety of edges, turns, generation of power, equal mastery of skating direction, and variation of speed allow for a greater range of detail in composition and expression of that detail through movement. It is possible to have a great depth of interpretation when skating skills are the highest. Focus on body lean and depth of edge – record how the skaters are moving their body in order to move quickly and powerfully across the ice (or not). Is there merely a vertical body line, or is there only forward-leaning body breaks, or do they incorporate a full range of movement off the vertical axis – and how do the power, speed, and flow differ between skaters with these qualities? Identify areas where the skater is changing up their power and speed, and know it! How do they generate power – from turns, mohawks, power threes, or stroking? Get the participants to identify areas in the program where they see changes in skating quality, or skating difficulty, or changes in speed and power. Ask them to identify what they think is generating these changes. Identify the depth of skating vocabulary for each skater… how many rockers, counters, changes of edge do you see versus mohawks and three turns? How does this compare with speed and flow of the skaters? Count the amount of time a skater spends on two feet. How is this incorporated into the program and is it “hidden” within choreographic design (such that we might not notice without direct focus)? For pairs and dance teams, study the differences between the two skaters with a keen eye. What do you see and how do you reflect this in your mark? Have fun with this. Aim to challenge yourself and challenge others on what it is that we are awarding with our marks for this Program Component. Do we take this mark for granted? We never seem to discuss it anymore! Are we biased with performance of big tricks? Do we really acknowledge and reward the use of body lean and abundance of the skating vocabulary and use of 1-foot skating and mastery of turning directions when we are evaluating everything else as well? The ODC would also like to address the use of vocal music in singles and pairs skating. This is a new rule, and I am not convinced that we always know how to reward it. We have no guidelines... in theory, it is rewarding PC's as normal, but is it? My personal thought on this is that adding vocals increases the depth of what is possible with Choreography and Interpretation but it can also destroy them, or be used to hide weaknesses. By this I mean when the skater uses strong lyrics or vocal content to mask interpretation and choreography through a manipulation of our emotions and perceptions of how to interpret. Meaning, we get so caught up in the strength of the lyrics and music that we run the risk of being distracted from the skater's movements, or do not see that (potentially) said movements are simplified to match the power of the music. Know what I mean? We then run the risk of over-rewarding simplified interpretation. Or, vice versa, under rewarding lyrical interpretation that we simply do not understand (if the skater chooses the lyrics and not the music as the main their main interpretation tool). In Singles and Pairs skating, we have no 'rhythmic beat' rule. They don't have to skate to the music per say. Alternatively, vocals can be used to enhance the performance quality and the impact of the skater's performance. This is a much more airy-fairy thing to deal with. If we connect with the music and the vocals, we might tend to over reward the performance - like going to a live concert with you favorite band and thinking it was absolutely amazing, and then watching it sometime later and seeing it for what it is, a bunch of guys with good stage presence banging away on guitars. Our history with use of vocal music has been 'interpretive' events and exhibitions. How do we deal with our own inherent bias for or against the use of vocal programs? If skaters use vocals as another instrument, or uses them to enhance the performance or interpretation experience (I am thinking the use of vocals in the last minute of Meagan and Eric's free skate 2014 Skate Canada International. Pairs - Free Skating. Meagan DUHAMEL / Eric RADFORD here as an excellent example) it is simple. However, if the skater chooses to use the vocals as the main interpretation tool (storytelling) and fails miserably in our eyes because they are not portraying the character (that we have in our own heads) perfectly or "correctly" how do we deal with that? Not good I think. it is challenging. It would be good to have a discussion with a couple of examples of this. Unfortunately in a webcast setting, we cannot have a good two-way dialogue. I think one thing that is for sure, is that exhibition programs, if performed like exhibition programs, should likely not be rewarded. These tend to be fluffy pieces that maybe do not have the choreographic phrasing, sense of transitions forming true links, or the range of transition and program choreography difficulty, or range of interpretation through nuanced body movement, that we might otherwise be expecting. One example is here - a recent example of mine 2014 Skate Canada International. Men - Short Program. Max AARON. How would you mark this?? This is kind of what I am talking about in being challenged how to reward or not. His marks ranged from 5.5 - 8.25 for Interpretation. As judges, it would be great to have a discussion on these things! Raising awareness and sharing experience. Physical, emotional, and intellectual involvement: Was there a physical, emotional and intellectual understanding in the performance? At what point(s) in the program did the skater convey this? How? Carriage & clarity of movement: Did the skater(s) demonstrate strong carriage throughout the program? How did affect their ease of movement? Were movements precisely performed? How did their clarity or lack of affect style, projection? Variety and contrast of movement: What examples were there in the program of variety and contrast? Were they effective? Projection: Was the skater able to establish a connection with the audience? Was it consistent throughout the program? When was the skater most comfortable projecting? Unison (pairs & ice dance): Did they move as one? Were they equal in projection, style, carriage ? Performance shows that skaters understand their music and its character, but Interpretation is how the skater shows you the musical details through movement. Without movement, how can they show musical interpretation? Physical, emotion, and intellectual involvement: Commitment to performance and making it work. Falls and errors break this commitment and must be reflected in this portion. Discuss how. Projection: What the skater delivers to the audience. How do they connect with the audience? How does one connects with the energy they radiate? Carriage: A trained strength of the body and its control throughout the performance. Clarity of Movement; Variety and contrast: Without carriage and body strength, it is difficult to have clear movement. How are these intertwined? Individuality and Personality: When the skater's body strength, clarity of movement, and projection combine together to create a clear personality on the ice. Did they achieve a certain style or flair? Expressiveness indicates individuality. Could this be clearly seen? Unison: Similar not only in movement but in skating ability, quality, line, strength, spacing/tracking, "oneness". Unison is achieved when the couple knows where they are without looking. Their partner is always there with them. Did the couple demonstrate this? How many times did the skater engage/obviously project to the audience? Mark how many seconds it takes for the skater to get back into the program after every fall or mistake they do. Is their commitment affected as the program progresses? Rate the skater's tiredness on a 1 - 10 scale. Mark how this affects their clarity and projection. At what point does the program become robotic? Rate your level of excitement or engagement of this performance on a scale of 1 - 10. Mark the times when you become bored or were struggling to pay attention to anything but the elements. Is there an audience reaction? Do you feel the same? Write down 3 reasons why it is okay to feel the same way to justify the marks you want to give. Do we reward pure performance enough? When a skater is in 'the flow' and can do no wrong (and is an absolute pleasure to watch) this is rare and should be rewarded. How much should this be rewarded? Are there levels of balance between performance and execution? Do the best performances always come with good execution? Is it possible to have more than "above average" or "good" performance without proper execution? Musical movement: How did the skater or team reflect the style, character and phrasing of the music? Were they successful? Did they rely on repetitive movements? If so was it effective or uninteresting? Expressive / Nuanced movement: Did the skater or team express musical details? How “detailed” were they able to be? Were such movements sporadic or consistent throughout the program? Did they understand the concept of a nuance? Effortless movement: Did the program appear effortless? If the effortless nature faded, at what point and how did that affect their component score? Ice Dance - Timing/Rhythm: In dance especially, were they in time with the music? In Short Dance, did they express the character of the music rhythms appropriately? In dance were they able to relate as one to express the music’s style and character? Interpretation is how the skater shows you the musical details through movement. Without movement, how can they show musical interpretation? When the movements and nuances of movement performed by the skater shows us the texture or elements of the music that we could not otherwise hear, we need to reward! The flow of movements that express the music should be effortless and fluid, not choreographed and robotic. Movements should incorporate the total involvement of the body to express the rich musical textures, both rhythmic and melodic. A range and variety of movements of the whole body are likely needed to express the musical complexity - changes of intensity, musical phrasing, crescendos etc. The use of nuance reflects higher skill levels. The more one is able to see the music through the skater's movements done in an effortless manner, the more they should reward this program component. What constitutes average, above average, good, very good, memorable/outstanding? Do falls break the musical movement - how to record and reflect? When do choreographic moves become musical movements apart from performance and style movements? Can novice level skaters have good to very good interpretation? Why? When, in your mind, is interpretation at a very good to outstanding level? How do you know? Look back at your worksheet... are they all lines and D's or mostly M's, or are there many N's and F's. How would you rank this program in terms of interpretation? Which marks would you apply? Poor musical movement; skater could be skating to any music.